Peggy and her guard of honour. It shows the trouble that the land girls, at a small hostel, went to at that first event to put on a really good show and involve a lot of people. 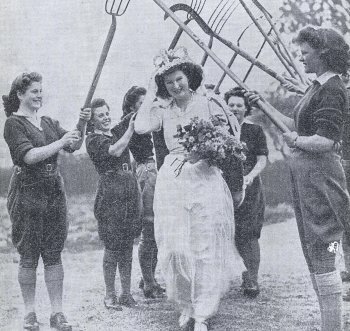 Nineteen-years-old Audrey ‘Peggy’ Clark, of Cardington, Bedfordshire, was made Britain’s first land girl May Queen, when her fellow Women’s land Army workers at Hulcote Moors hostel, near Cranfield, came up with the idea and elected her to be their May Queen. Hulcote Moors was the smallest of the hostels for land girls in Bedfordshire – a large farmhouse accommodating 18 young women who went out each day to work on local farms. The idea was to raise money for the WLA Benevolent Fund for land girls in need. They raised £33 after expenses. 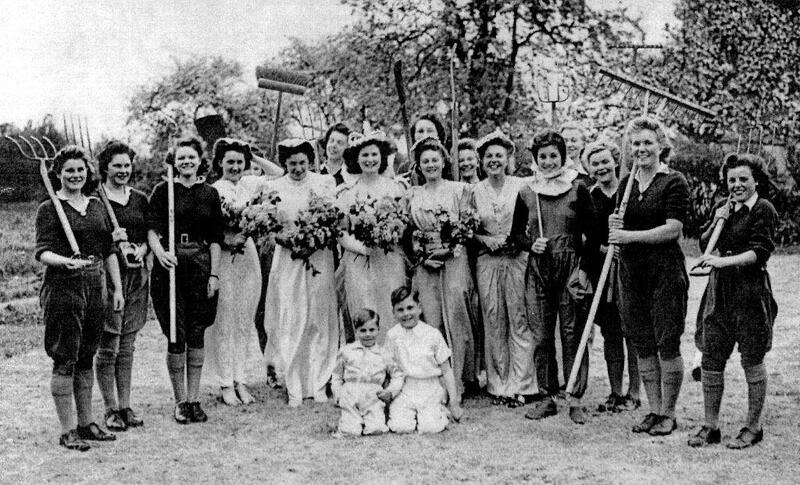 After the crowning ceremony on the lawn of the farmhouse, land girls danced around a maypole to the accompaniment of Heath Excelsior Band. There was a procession of land girls in their distinctive uniform down the Cranfield’s main street, plus decorated vehicles and riders on horseback. Mrs A. Truman, the WLA’s county Entertainments Officer – a large lady – dressed as Queen Victoria and sat in a horse-drawn landau. Finally, they were followed the May Queen, surrounded by her maids of honour, enthroned on a hay trolley drawn by a tractor. In the evening there was dancing on the lawns of the farmhouse hostel with a dance band form Colmworth, and a party in the house. To find out more about Audrey ‘Peggy’ Clarke – please click here.